Lair of Dreams picks up not long after the events of the first volume, The Diviners. Evie O’Neill has left her uncle’s New York City home and is the latest popular celebrity, using her psychic skills — she can touch an object and see its history — and her quick wit to gain fame and fortune. Evie has told Jericho, her uncle’s assistant who is in love with her, that she can’t continue to see him because Evie’s best friend Mabel is in love with him. Evie is manipulated into a pretend engagement with Sam, a handsome con man and thief who is hiding secrets of his own. But events will pull all of them together, as well as several other familiar characters from the first book and a few new characters, to fight the ghostly problems that continue to plague NYC. Somewhat to my surprise, I enjoyed Lair of Dreams much more than The Diviners. Evie is still, for me, an irritating and rather self-absorbed character, but it becomes clear that she’s drinking and partying hard to try to avoid her problems. She pulled her hand free of Sam’s grasp, and he let her go, watching as she ran headlong toward the hedonistic throng. Lair of Dreams also weaves together several other threads, including Ling, a Chinese girl handicapped by the aftereffects of polio, who is a dream walker; Henry, another dream walker who is searching in both the dream world and the real world for the boy he fell in love with in New Orleans; and Memphis, a young black man struggling to deal with both his healing abilities and his forbidden love for a white woman. I thought these interrelated stories worked well together, and all of them were interesting to me, particularly with Ling and Henry meeting in the dream world, working together but each pursuing his or her individual interests and goals. The ghostly plot, though it involves many deaths, was intriguing, especially the dream world and its interrelationship with and effect on the real world — and it wasn’t nearly as off-putting to me as the devilish serial killer spirit in The Diviners, although some readers may miss the higher level of creepy horror. The overall plot had a few too many threads to it, risking loss of the reader’s attention from the frequent point of view switches and different plotlines. When the dream creatures enter the real world and start attacking people in the streets, the story strays from its initial sense of dreamy horror. There are also several plot lines that are left unresolved for the next volume in the series. Just as the book is wrapping up and most of the threads were being tied together, several pieces of the plot begin to unravel again with an extended epilogue that leaves the reader with some rather irritating cliffhangers. “You’ll be safe in here,” her uncle said and shut the door. But Ling knew she wasn’t safe anywhere. Not when people could hate the very idea of you. Not when there were ghosts in your dreams. Ling shut her eyes and listened to the sounds of her neighbors being taken away in the night. 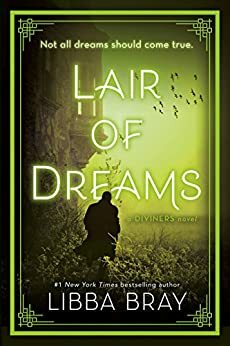 If you liked The Diviners, I think you’ll really enjoy Lair of Dreams. The follow-up to Libba Bray‘s The Diviners is not quite as good as its predecessor, but still a highly entertaining read. In the previous book we were introduced to characters that come to be known as Diviners, each with their own unique supernatural gift. Evie O’Neill has visions when holding particular objects, Henry DuBois can walk through dreams, Sam Lloyd can make himself invisible, Theta Knight can conjure fire and Memphis Campbell has healing abilities. In this book we’re also introduced to Ling Chan, who can speak to the dead. All of them live in 1920s New York, a city of jazz and prohibition, excitement and danger, opportunities and prejudice, and each one has a strikingly different outlook on life. For some their diviner gifts are a ticket to fame and fortune (Evie, enjoying a radio gig reading people’s fortunes), for others it’s a curse that must be concealed at all costs (Theta, who is on the run from an abusive husband). Yet others want to use their talents to achieve something in life: Henry wanders dreams in search of his former lover, while Sam is desperate to solve the mystery of his mother’s disappearance. But in one way or another, all of them are caught up in the fear of mysterious “sleeping sickness” that’s sweeping New York. People go to sleep and can’t be woken, though it’s clear from their expressions that they’re having terrible nightmares. The illness seems focused on the Chinese community, which leads to quarantine and racism rearing its ugly head. Each character has their own subplot, but as the chapters go on they’re slowly drawn together as more clues emerge as to what’s causing the sleeping sickness and how the diviners can utilize their powers to stop it. Amidst all their disagreements and squabbling, despite all their differences in background and personality, they all have one thing in common: the ability to help other people. Watching them come together as a sort-of superhero team is immensely satisfying, as is the way they play off each other at various points of the book. The plot isn’t quite so streamlined as The Diviners, which involved a frightening hunt for an occult serial killer, and much of what’s here is setup for the next book: the mysterious man in the stovepipe hat, the existence of Project Buffalo, Theta’s realization that her abusive ex-husband has tracked her down — but in itself Lair of Dreams is a solid read. I especially love the fact it’s not afraid to be long. Sure, a couple of chapters are a bit superfluous, but Bray has clearly done her work on the time period and takes great delight in immersing the reader into the Roaring Twenties. The slang, the music, the parties, the advance in technology — it’s all here. But Bray doesn’t ignore the darker side of the period — or in fact, of American history. It’s not just the supernatural that our protagonists have to contend with, its sexism, racism, homophobia and ableism. These monsters are sadly just as prevalent today as they were back then, and Bray makes it a necessary part of her backdrop without being too preachy about it. Particularly noteworthy is the array of characters and their disparate backgrounds: Memphis is black, Sam is Jewish, Ling is Chinese, Henry is gay — all of them see the world from a slightly different angle, and all of them have their own unique obstacles to surmount. For Memphis and Ling and Henry, ghosts are easier to deal with than the prejudices of their fellow Americans. It’s easy to get drawn into their lives, and I haven’t even mentioned Mabel or Jericho or Will! Bray does an exceptional job of keeping track of their stories and their personal struggles, and I’m looking forward to seeing how their dynamic evolves in the next book: Before the Devil Breaks You. Published in 2015. The longing of dreams draws the dead, and this city holds many dreams. After a supernatural showdown with a serial killer, Evie O’Neill has outed herself as a Diviner. With her uncanny ability to read people’s secrets, she’s become a media darling, and earned the title “America’s Sweetheart Seer.” Everyone’s in love with the city’s newest It Girl…everyone except the other Diviners. Piano-playing Henry Dubois and Chinatown resident Ling Chan are two Diviners struggling to keep their powers a secret–for they can walk in dreams. And while Evie is living the high life, victims of a mysterious sleeping sickness are turning up across New York City. As Henry searches for a lost love and Ling strives to succeed in a world that shuns her, a malevolent force infects their dreams. And at the edges of it all lurks a man in a stovepipe hat who has plans that extend farther than anyone can guess….As the sickness spreads, can the Diviners descend into the dreamworld to save the city? 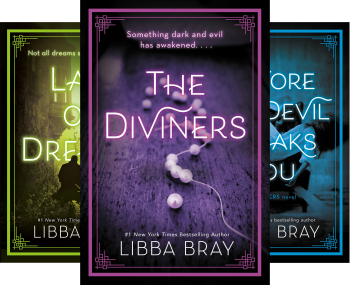 In this heart-stopping sequel to The Diviners, Printz Award-winning and New York Times bestselling author Libba Bray takes readers deeper into the mystical underbelly of New York City. Yes, I especially liked the Chinese characters in this book. I don’t know that I would have caught any inaccuracies in her descriptions of 1927 NYC Chinatown and its culture and inhabitants, but my sense is that Libba Bray was very careful in her research. This is an interesting time period in America’s history and I like the idea of exploring it from different angles based on your cultural experience. I do think the illness sounded a little bit like “The curse of Kig Tut’s tomb” though. Well, of course “the curse of King Tut’s tomb” wasn’t an actual curse either. Libba Bray has a way of making the main characters sympathetic even when they’re doing stupid things (like Evie trying to party her way to oblivion every night, instead of figuring out how to do something worthwhile with her talent). Notice there’s a one or two sentence cameo appearance by Gemma Doyle from Bray’s other trilogy partway through this book. I enjoyed that series too, but I guess some people didn’t find the characters as likable. These books are smart YA, not great Literature–I’m looking forward to the next one.